A number of different projects are being conducted in the lab. My students typically undertake related, but non-overlapping projects with my main projects, but we all work as a team to improve and refine each project. See people pages for all of these projects. I have three main projects going in the lab currently. I. Using historical and contemporary approaches to reconstruct the ecological niche. Using a group of mustards in the genus Streptanthus (sense lato), I am working with colleagues to understand niche evolution in Streptanthus, a diverse group of mustards, many endemic to the California Floristic Province. With my former post-doc N. Ivalu Cacho (now faculty at UNAM in Mexico City) and colleagues from TAMU, Alan Pepper and students, we have generated a phylogenetic hypothesis for the group (Cacho et al. Molecular Evolution and Phylogenetics 2013) and are using this hypothesis to understand trade-offs associated with soil specialization, specifically serpentine endemism. We use current ecological competition experiments in field soils, field ecological data collections and trait surveys, and combine these data with the phylogenetic hypotheses to understand the selective pressures and trade-offs, including both biotic and abiotic forces, leading to edaphic specialization. Our field sites span Southern CA to Oregon, from deserts to high mountains, coastal areas and inland. 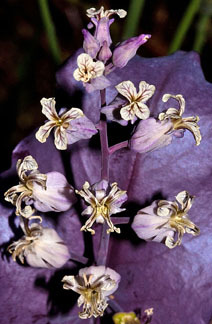 Streptanthus and allies are called ‘jewelflowers’ and I think these flowers are super cool and beautiful. This helps keep me going when I am struggling in their preferred habitat of hot, south-facing very loose, steep and rocky slopes. Our most recent work is exploring the evolution of plasticity with respect to drought tolerance in Streptanthus, in collaboration with former post-doc Ian Pearse (now at USGS in Fort Collins, CO). II. Understanding the role of rhizobia and soil communities in coexistence of diverse Trifolium species assemblages. 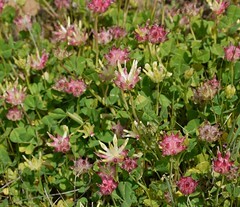 At the Bodega Marine Reserve, there are 9 native species of Trifolium, and many introduced ones. In collaboration with Maren Friesen at MSU, and post-doc Andew Siefert, we use transcriptomics of Trifolium species planted across soil niches, in the presence and absence of the local competitor, as well as rhizobial sequencing and rhizobia-species affinity/interactions to understand competitive/mutualistic interactions, N-fixation efficiency and ecological coexistence. III. Niche conservatism in plant communities. With former post-docs Jean Burns (Assoc. Prof Case-Western Reserve University and Brian Anacker (former postdoc, now at Boulder Open Space Commission), I am studying plant community assembly at the UC Bodega Marine Reserve. We use experimental approaches, planting individuals into the niches of more and less closely related species, to understand niche conservatism and coexistence among species. We are also measuring many traits and environmental attributes across our site to understand the major contributors to coexistence in this diverse community.